More than 400 local residents will be employed to work on the Star Mountain Plaza development as the site workforce expands by 60 percent over the next two months. 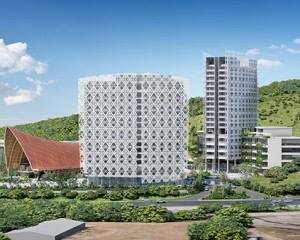 The developers of Papua New Guinea’s first convention and performing arts centre are recruiting another 157 workers as the first stage of construction nears 60% completion. Mineral Resource Development Company managing director Augustine Mano says the skills based training programmes offered to those working on the site will benefit the local tradesmen for many years. “The Star Mountain Plaza project is creating a legacy asset for future generations of Papua New Guineans. “In addition to the economic benefits of building the convention centre itself, we have the chance to train the local workforce in a wide variety of trades - something we believe will benefit the community for years to come,” he says. Mr. Mano says they are currently recruiting for staff in administration, procurement, supervising managers and labouring roles. He says all staff are offered a number of workplace benefits including the provision of three catered meals and unlimited bottled water each day. Mr. Mano says the health and safety of their employees is of paramount importance and staff have immediate access to private hospital healthcare which is paid for by the company. “Staff are covered by Workers Compensation Insurance and we will introduce free annual medicals and wellness check ups for all employees,” says Mr. Mano. “We want Star Mountain Plaza to be known for its economic and social contributions to the nation,” he says. Mr. Mano says the company also provides a consistent supply of electrolyte supplements to help prevent dehydration.